Tickets for the middle Sunday of Wimbledon sold out shortly after being offered for sale online. Nearly all the 22,000 tickets were snapped up within half-an-hour after going on sale at 15:00 BST on Saturday. Tickets, via the Ticketmaster website, were priced at £20 each for ground passes to outside courts, £40 for Court One and £70 for Centre Court. An extra day has been scheduled for the first time since 2004 to help clear a backlog after rain disrupted play. The order of play will be released later in the day although it is thought there will be at least eight singles matches - mainly in the women's draw - and a variety of doubles contests. "This has been a difficult decision, but one we had to take to reduce the backlog of matches and in the interests of completing the championships on time," said Richard Lewis, chief executive of the All England Lawn Tennis Club. "And as with other Middle Sundays, I am sure there will be a great atmosphere." This will be the fourth time, after 1991, 1997 and 2004, there will be action on the tournament's seventh day - traditionally a rest day. Gates will open from 08:45 BST, with play scheduled to start at 11:30 on all courts. 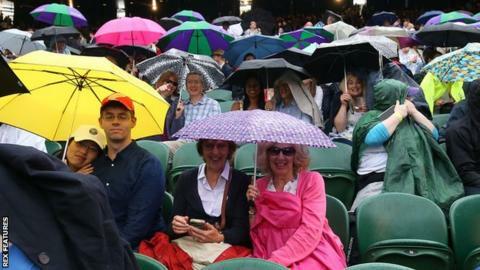 While demand was heavy for Sunday tickets, wet weather has been blamed for a drop in attendances at Wimbledon this week. After five rain-hit days, nearly 15,000 fewer fans had walked through the gates than did so in the equivalent period last year. Before Saturday's action, the combined attendance stood at 195,875 compared to 210,358 last year. Before Saturday's action, the combined attendance stood at 195,875 compared with the 210,358 who were there at this stage 12 months ago. Attendances were down on four of the first five days, with crowds falling below capacity on two consecutive days for the first time since the soggy 2004 championships. "The weather has been the main factor," said a Wimbledon spokesman.